Tullybay Holiday Homes are beautifully appointed 5-Star luxury cottages situated alongside the Marina with superb views across the lake. 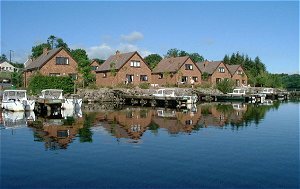 A fishing boat can be hired from our Reception for each cottage. 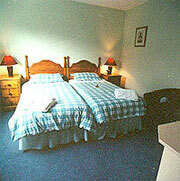 Each centrally heated cottage has 3 bedrooms – one with a kingsize bed and 2 with twin singles. There are 2 bathrooms with shower/bath, toilet, basin and razor socket. 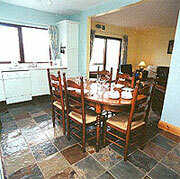 The living area comprises a large open plan living room and kitchen. 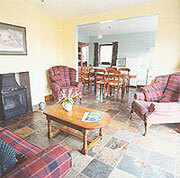 The living room has an open fire, satellite TV and french windows onto a patio with table and chairs. The kitchen is fully fitted with all modern conveniences as well as a dishwasher, coffee maker and clothes washer. Special provisions have been made for access by wheelchair. Tullybay Holiday Homes are ideally situated in an area renowned for its excellent Trout fishing, which is good both early and late in the season. The game fishing season is from 1st March to 30 September. Brown and Rainbow trout are the more common species with the occasional salmon. Coarse fishing is available all year round. Anyone fishing for pike, perch, bream, roach or eel only, require a coarse fishing license and permit, which are available at our Reception. No license is required for persons under 18 years. Adjacent to the A46 Enniskillen to Donegal road.